Breguet is delighted to be joining the inaugural event to showcase the recently acquired exceptional dashboard chronograph created for Bugatti. The City Concours event will take place on Thursday 8 and Friday 9 June within the grounds of the Honourable Artillery Company headquarters, a remarkable five-acre open space surrounded by historic buildings in the heart of the Square Mile. It will be the first time the Breguet chronograph No.2023 will be shown to a UK audience, a rare opportunity to see the watch which testifies to the brilliant and remarkable diversification demonstrated by the Maison throughout its history. The dashboard chronograph No. 2023 was produced during the interwar years and demonstrates the highly diverse range of activities carried out by the watch manufacturer. In addition to creating pieces for the navy and the aeronautic industry, Breguet also supplied automotive brands throughout its history. Brilliant car manufacturer Ettore Bugatti, who was a faithful friend of the Maison, placed his order at the beginning of the 1930s. He wanted to fit his luxurious “Royale” cars with a chronograph featuring a tachymeter function, intended to be placed in the middle of the steering wheel. The Manufacture responded to his request by offering a range of timepieces that incorporated all the expertise acquired by the Maison since its foundation in 1775. The dashboard chronograph No. 2023 was acquired from Artcurial during the closing auction of the Rétromobile Exhibition, an unmissable event for classic car enthusiasts. 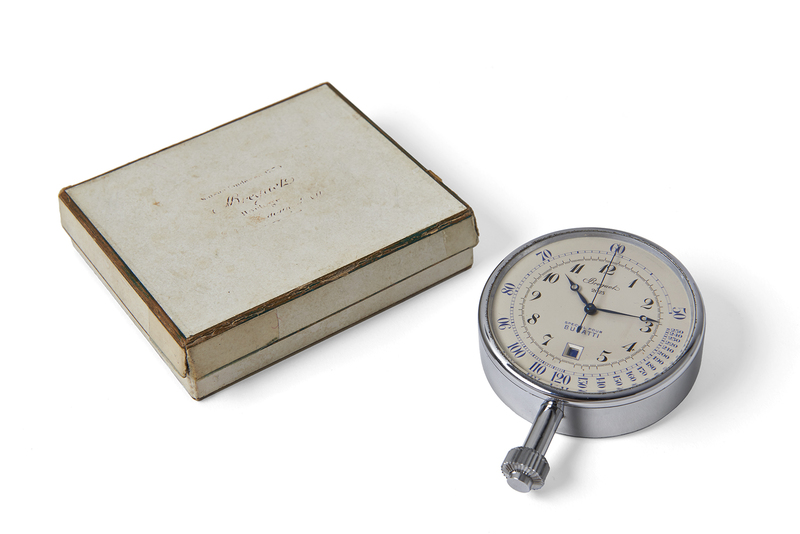 The piece, which was originally sold to Bugatti in 1932, belongs to a series of nine car timepieces that Breguet designed specifically for the brand. It’s chrome-plated metal case measures 67 mm in diameter and houses a complication carefully chosen for the automotive industry: a tachymeter scale. Its cream dial, which bears the words “Spécial pour Bugatti”, features the famous blued-steel Breguet hands that were designed in 1783. Chronograph No. 2023 also has a cumulative minutes counter visible in an aperture at 6 o’clock. The timepiece is powered by a mechanical movement with a power reserve of eight days, which is wound using a crown located at 6 o’clock. This exceptional creation was sold in its original box.